There’s nothing quite like the pure spirit and shining, happy faces of talented young teens and kids. 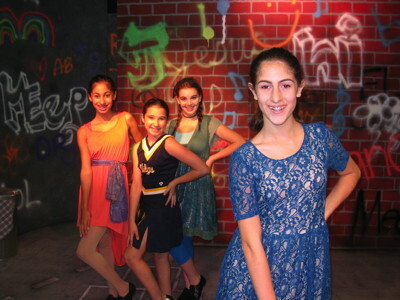 Provided with a suitable vehicle, namely Godspell, Jr., the vibrant energy of this mostly female, mostly eight-grade cast of eight kids provides a great night of musical entertainment. Fittingly, the classic Broadway hit musical from the seventies, Godspell, has been refashioned for young audiences and young performers. 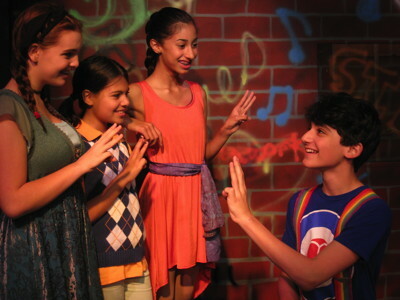 Godspell, Jr. is a fun and sweet production now running on weekends at the Eclectic Company Theatre in NoHo until Nov. 18. Originally co-conceived by John Michael Tebelak, the music and lyrics are by the musical’s original composer, Stephen Schwartz. Here the musical’s applicability for sweet, young voices really shines. With its free-wheeling, hippie interpretation of the New Testament, the structure of the musical is that of a series of parables, based on the Gospels According to St. Matthew and St. Luke. The parables are interspersed with a songs set primarily to lyrics from traditional hymns, with the ‘Passion of Christ’ shown briefly near the end of the performance. This production, directed by Bonnie Hellman, features a cast whose ages range from fourteen to ten. The voices are good, with a couple of very strong ones as leads in some of the songs. The show’s Musical Director, Roy Leake, Jr., performs piano upstage throughout. The storyline and presentation is updated a little bit, such as a ‘beatbox’ interlude for the parable of the King that preaches forgiveness and compassion. Other modern moments include a brief reference to the hit pop tune ‘Gangnam Style’. Original gags such as the TV show Laugh In references – ‘Here Comes de Judge’ – are likely to go over most people’s heads. A hand puppet sequence used to illustrate one of the parables is a show highlight, offering the kids a chance to show off their funny voices. This great little cast give great performances. In 1970, John Michael Tebelak, then a student at Carnegie Mellon University, went to church on Easter Sunday and immediately afterward was stopped by a cop who searched him for drugs because he had long hair. Tebelak was inspired to create “Godspell,” a musical about the most famous long-haired rebel of all, Jesus. The show opened at La Mama Experimental Theatre Club in 1971, then moved off-Broadway, then to Broadway, accumulating over 2,000 performances in New York alone. It became an international hit. Composer and lyricist Stephen Schwartz won two Drama Desk Awards, two Grammys, and received a Tony Award nomination for his work on the show about a hippie-era Jesus surrounded by a crew of clowns and vaudevillians which managed to communicate much of what was inspiring and uplifting about the life, teachings and parables of Jesus without judgmentally shoving religious dogma down anyone’s throat. Musical director: Roy Leake, Jr. Choreography by Terry J. Barto. Produced for the Children’s Theatre Group of Southern California by Robert Briscoe Evans and Sherry Lynn. Runs through November 18, 2012. Running time – approximately 70 minutes, no intermission.